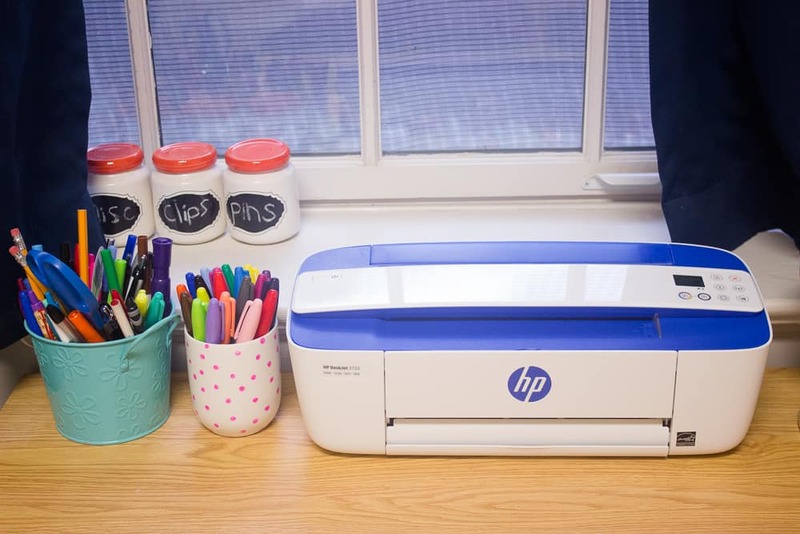 This post is sponsored by HP and I’m excited to share my senior dorm room with you! I keep most of the same pieces from year to year and just add a few things to fit the space and make it feel fresh and new. I’ve shared glimpses into my room each year (freshman, sophomore, junior), and now that it’s my senior year, I’m continuing that tradition! 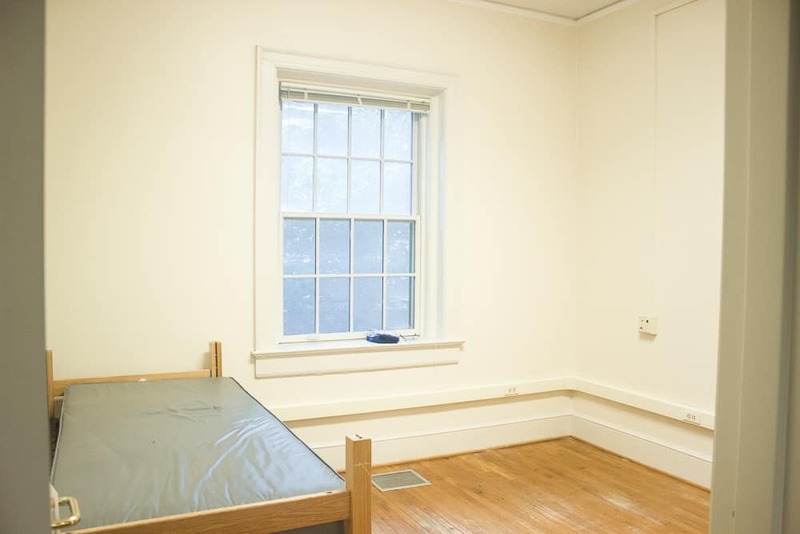 For the past two years, I was really blessed to have a huge room with tons of natural light all to myself (as an RA), but this year, I’ve faced a new challenge of having a much smaller room. It’s so narrow that after I laid out my rug, I could only open my door about halfway! There are also giant trees in front of my window, so the natural light is sadly limited. I’ve taken this to a little bit of an extreme in my small dorm room this year. 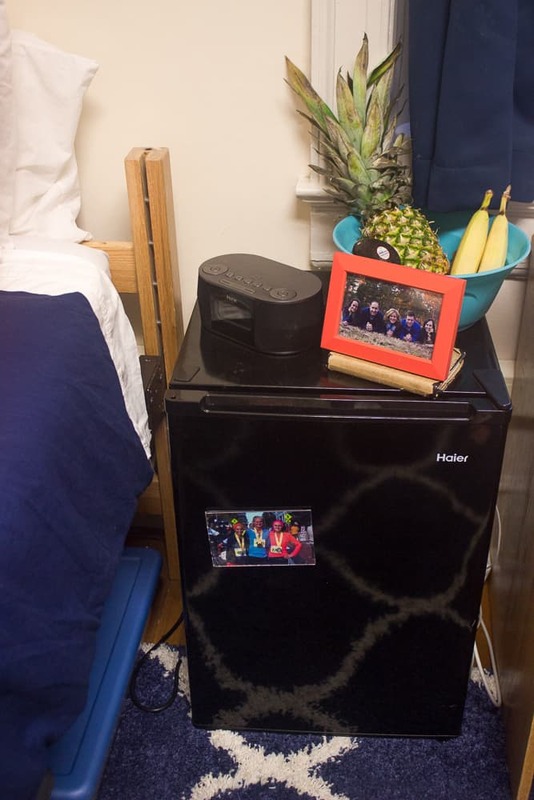 For example, the mini fridge beside my bed also serves as a bedside table with an alarm clock, frame, and fruit bowl on top. On top of my other mini fridge, I keep my microwave, and on top of my microwave, I have a dish drying mat, in addition to my silverware and paper towels. There’s hardly an inch of wasted space. A benefit of not being able to open my door all the way is that it created a space behind the door for a new shelf where I keep a lot of my kitchen supplies! 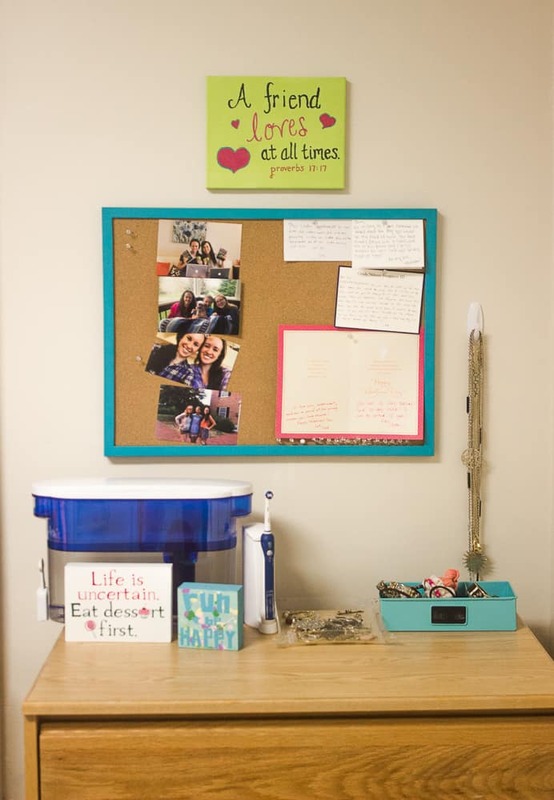 For example, the bulletin board above my dresser is decorative, but it also holds cards, notes, photos, etc. and keeps clutter off my desk. It’s pretty empty now and just has a few notes I had lying around, but I’ll fill it up within the next few weeks. I had a great shelf last year that was just too wide to fit anywhere in my room this year, so I traded it for a tall, dark shelf from my parents’ attic. I also purchased a small, narrow white shelf on Facebook Marketplace for $5. If you haven’t heard of Facebook Marketplace, it’s like Craigslist, but better because you can search on Facebook for specific items that people in your area are selling and then message the sellers directly. This little white shelf was a steal! Since the small shelf is white, it didn’t go with the darker furniture in my room. I didn’t want to invest time into painting it just for this year, and I don’t know yet how/if I’ll use the shelf in the future, so I put it in my closet. Perfect! For example, I bought a printer this year and did some research to find the most cost-effective and space-efficient printer possible. 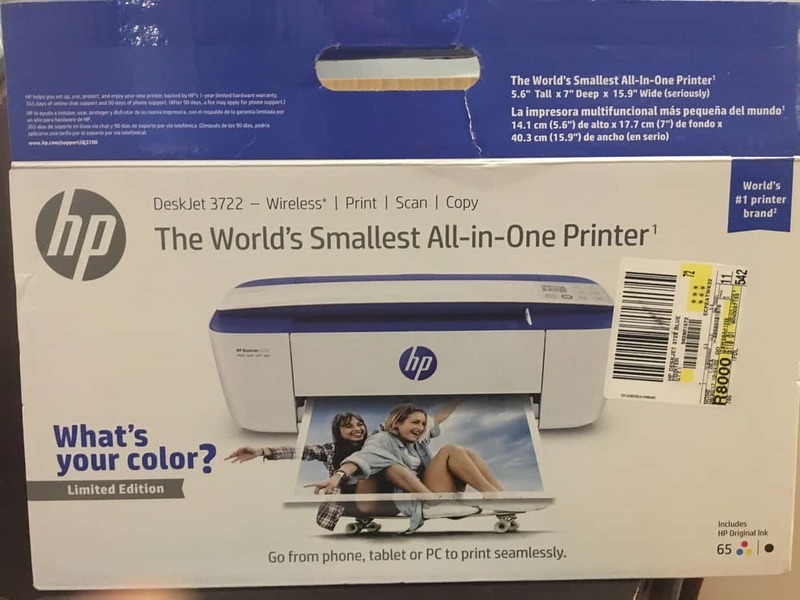 I ended up buying this HP DeskJet 3722 All-in-One printer/scanner/copier, which is the world’s smallest all-in-one printer. It’s great for a dorm room since it’s slim and takes up hardly any space on my desk. I have a standard-size desk, and the printer occupies about 1/9 of it. Since I don’t like having a cluttered or overly full desktop, this makes it a perfect fit. There’s also a really cool feature that lets me print from my smartphone, and I can scan things with my phone when I’m on the on-the-go. The print quality’s great, too! With a small room, it doesn’t take much for the space to feel cluttered, even if there are just a few things on the floor. Having a LOT of storage space (numerous narrow shelves, two hanging shoe racks in my closet, etc.) has been so helpful for making sure that every single item has a place, and isn’t just hanging out on my floor or sitting on my desk. Store things underneath a bed, couch, etc. This may mostly apply to dorm rooms and bedrooms, but I set my bed up high enough that I can store my foam roller, laundry basket, pots & pans, etc. underneath. My futon is also high enough that I can store my laptop, lap desk, charging cords, etc. underneath it when I have people over to hide some of that clutter. So, there’s my dorm room this year! If you’re interested in the printer, it’s available at Walmart in the electronics section. 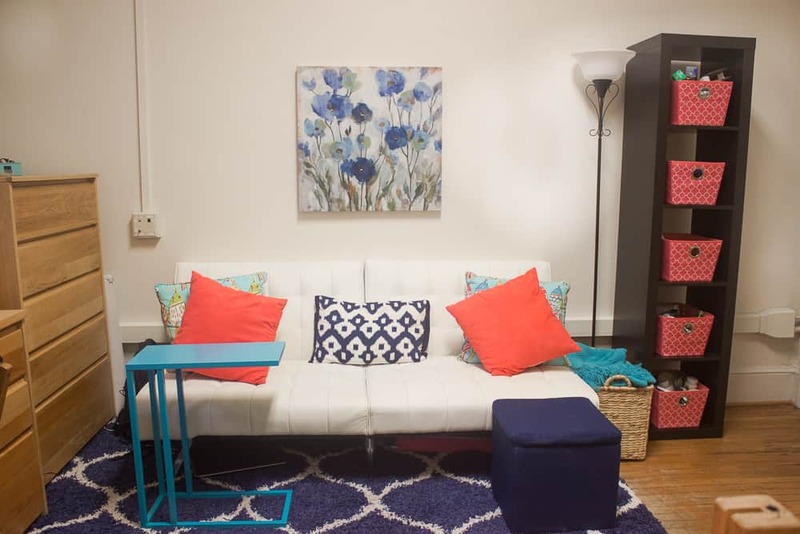 Walmart has three great colors– pink, purple, and blue– and even though I’m usually a pink girl, I picked blue to better match my dorm room. If you’re in the market for a super cost-effective printing option, you can hover over the photo to shop this printer! 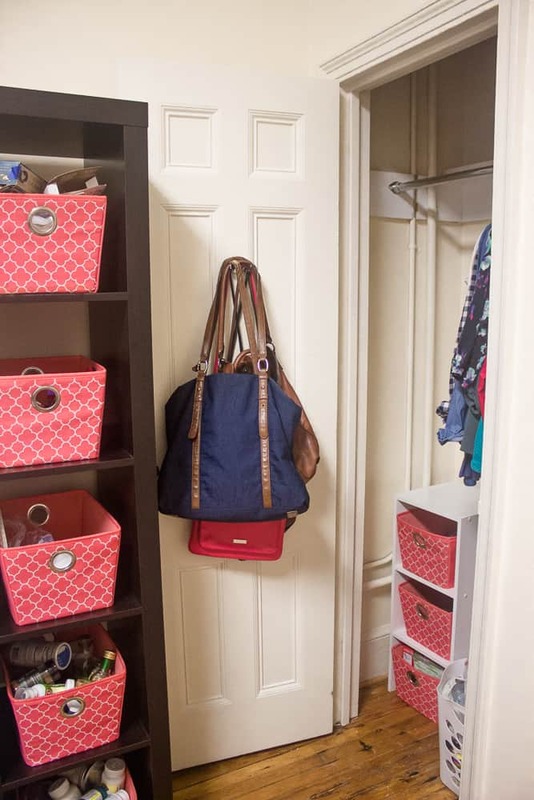 What are your best space-maximizing tips for living in a small room/house/apartment? 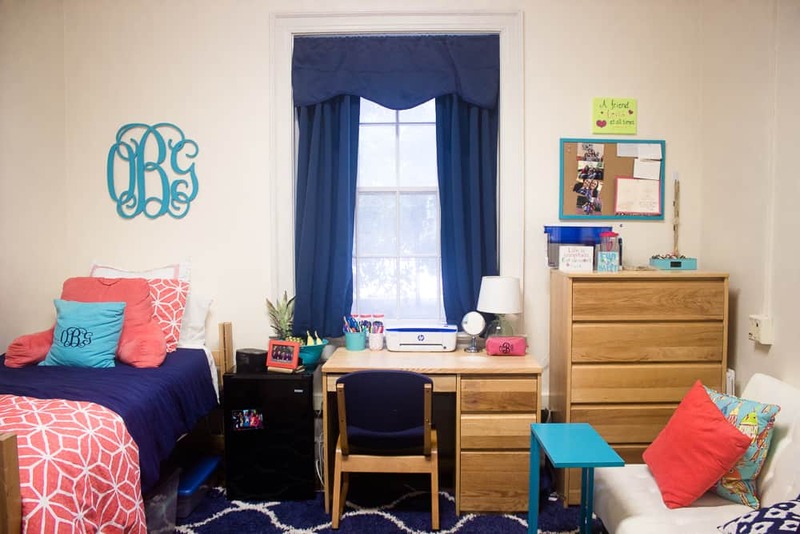 I always love seeing your dorm room tours every year! I really needed you to come decorate my dorm when I was in college! I am so excited for you to start off your senior year!! It was by far my favorite year of college and the more removed I am from college, the more I miss it. Thanks so much, Brie! And I’ll cherish every second of it! Cute space! I love that you kept things practical and fun at the same time. Hope this is a great senior year! I LOVE your cute space; it’s so colorful and cozy looking. I like the idea of using furniture to be dual purpose and getting smaller furniture. You definitely utilized every corner and made every corner look so pretty and homey. 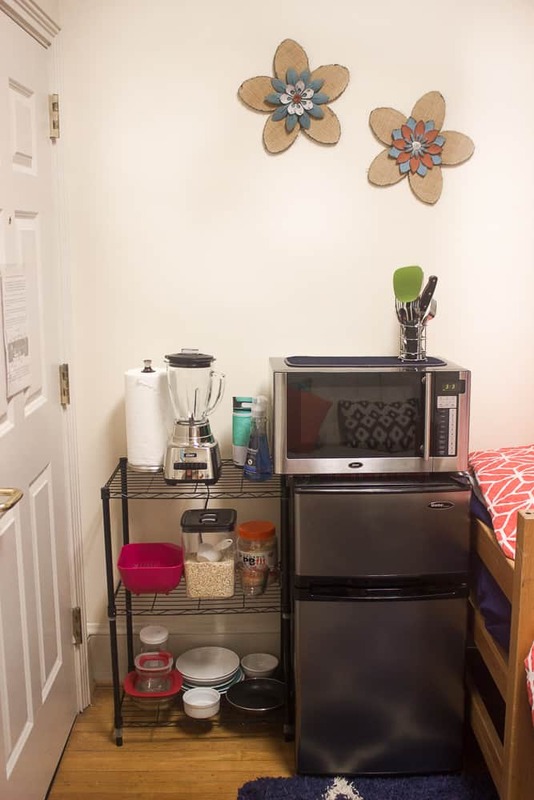 Olivia, you amaze me with your creativity in making such a functional, yet attractive dorm room. Who knows, you may use some of these ideas when you go to law school. I’m glad you like it! Thanks, Gee! 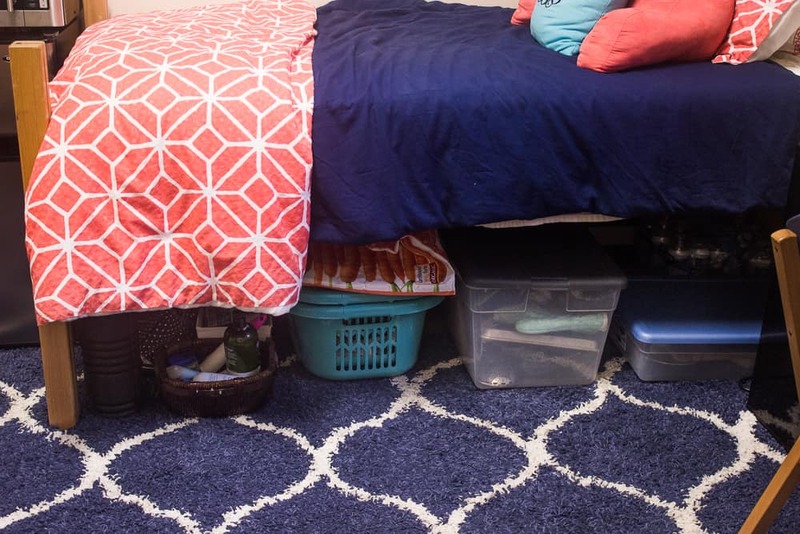 I can’t believe how awesome your dorm room looks! I always felt like my dorm room was so plain. You’ve injected just enough color and fun! Thanks so much, Stacey! I’m glad you like it! You seriously have the best decorating style, Liv! Also, I think we need that printer. We didn’t bring Eric’s huge printer with us to California as there’s really nowhere to put it in our (tiny) apartment… but I miss having a printer. Thanks for the tip! Thanks so much, Claire! Hope you’re loving California!